Die deutsche Version des Beitrags findest du hier: Die Dunklen Künste in den Harry Potter Filmen. After my first post on the making of the Harry Potter movies and visiting the original film studios in London, this follow-up does now focus on the fascinating, mystic and intriguing part of magic, the other side of the wizarding world – the Dark Arts. The Dark Arts, also known as Dark Magic, refers to magic that is mainly used to control or to cause harm and even death to a victim. Though the Dark Arts aren’t necessarily “evil”, the practice is discouraged. 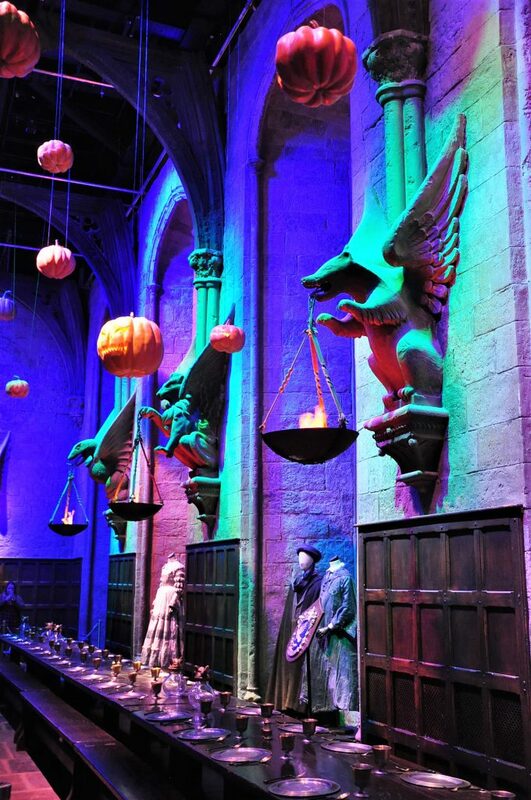 Because of the amazing atmosphere of this special season, it was my big wish to visit the Warner Brother Studios in London and Hogwarts on Halloween, to see the Great Hall with its flying pumpkins and all the tables full of festive Halloween meals. I took a wonderful look from Gracy Q with me that in my opinion matches the wizarding wardrobe wonderfully, furthermore I am quite sure that Professor Umbridge would have loved my pink blouse! 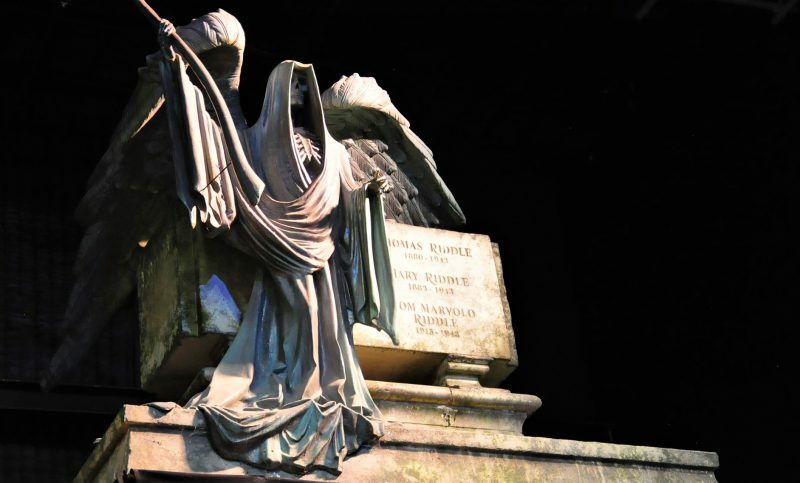 I would love to share with you this exciting experience of Hogwarts on Halloween and its darker side, including the Set Decoration, some of the original props, costumes and the coming to life of the Death Eaters. So pick up your wand and a magical pet of your choice (I would recommend a cat) and follow me to the darker corners of the wizarding world. „ I think J.K. Rowling‘s vision is intriguing. It captures so many levels of imagination.” Steve McMillan, set decorator. The Set Decoration is a branch of the Art Department of the movies, that develops and selects props. 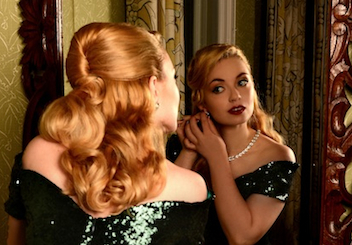 It also dresses the film’s sets in collaboration with the production designer. 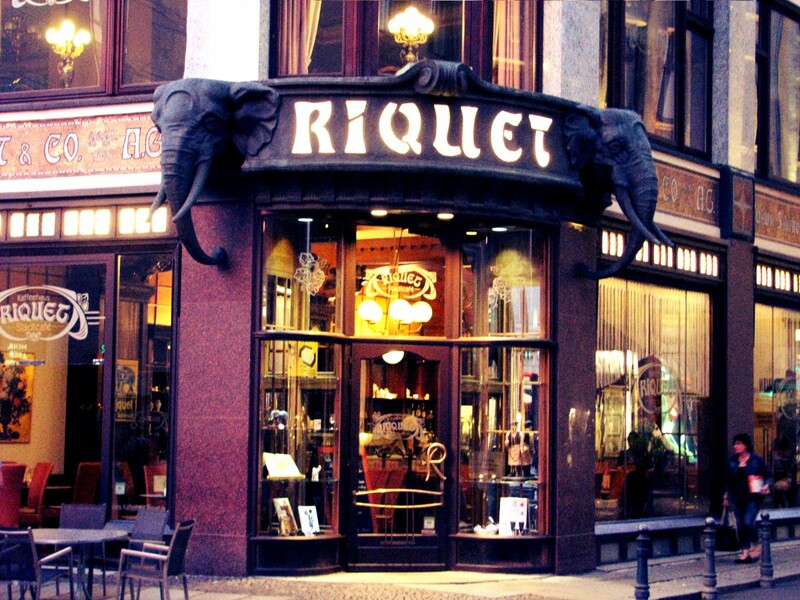 The work of Set Decoration includes researching, sourcing and making furniture, drapery, light fixtures, art and many other decorative objects large and small. Our first steps into the Studios take us to the one place where it all comes together in each and every movie – one of the most beautiful sets in the Harry Potter films – the Great Hall with its magic ceiling. To create the illusion of the floating candles in the Great Hall for Harry Potter and the Philosopher’s Stone, every candle was made of a candle-shaped tube filled with spirit oil and topped with a wick. Each candle was suspended by a tungsten wire from a motorised rig, which was digitally removed during post-production. However, during the first days of filming, candles burned through the wire and fell onto the tables. To secure the actors, the producers decided to cut most of the rigs in the Great Hall und create the illusion in a digital way instead. On Halloween the beautiful candles were replaced by pumpkins and it was a moment of goosebumps entering the Great Hall! Above you see the Slytherin table including garment of Slytherin members, such as Professor Quirrell, and the ghosts. 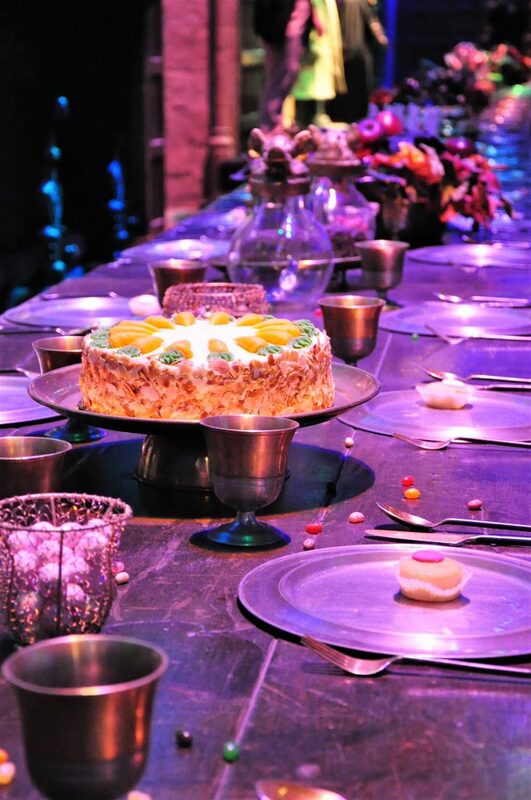 The Gryffindor table below is decorated with delicious Halloween meals. Some of them were really eatable. “The foggy shapes in the Foe-Glass were sharpening, had become more distinct. Harry could see the outlines of three people over Moody’s shoulder moving closer and closer.” Harry Potter and the Goblet of Fire. 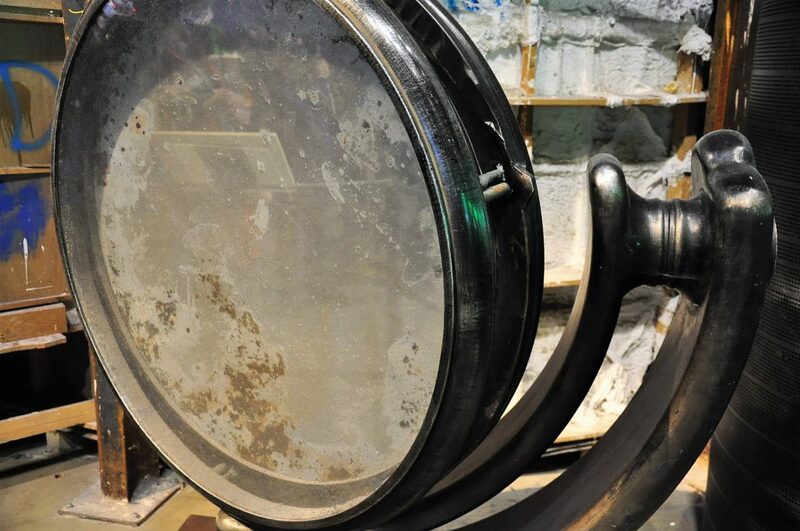 This massive lens is maybe not one of the most well known props, but to me a really fascinating one. It is said to have the power to reveal one’s enemies and first made its appearance in the Goblet of Fire. The Prop Manufacturing Department created the glass based on design renderings of the Art Department. 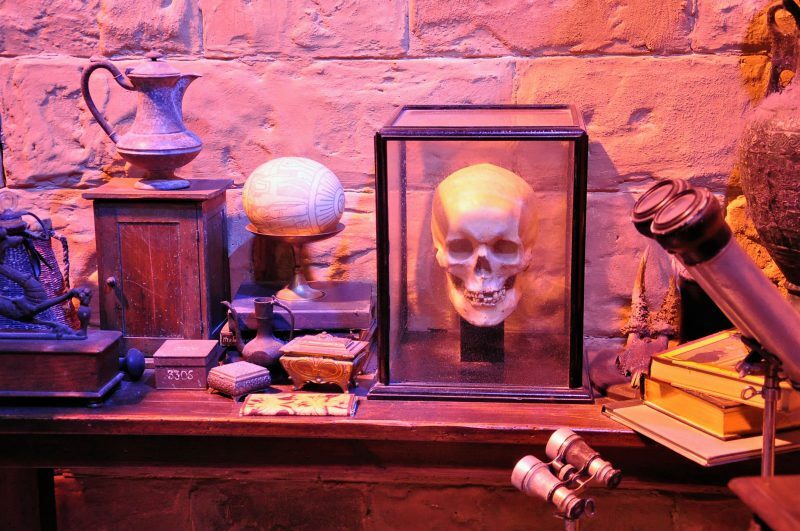 A second, cracked version of the Foe-Glass also appears in the Room of Requirement in the Order of the Phoenix. Moody’s Trunk is another important prop in the Goblet of Fire. 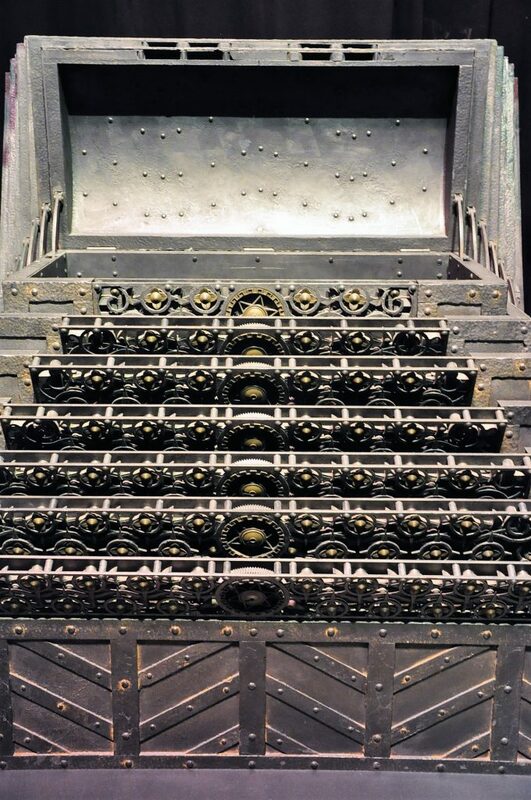 It consists of seven hidden, bewitched compartments, where Barty Crouch junior secretly imprisoned Mad-Eye Moody. The Special Effects department built the prop so that each of the compartments mechanically opened, like magic, to reveal a smaller one. “…he saw a solid wall ahead on which entwined serpents were carved, their eyes set with great, glinting emeralds… ‘Open,’ said Harry, in a low, faint hiss. The serpents parted as the wall cracked open…” Harry Potter and the Chamber of Secrets. 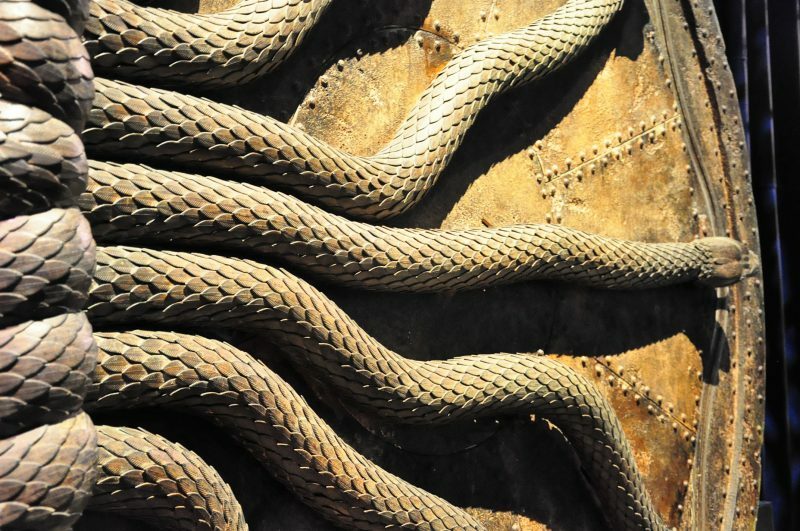 Another one of the very large and impressive props in the Studio Tour is the snake door leading to the Chamber of Secrets. Because of its highly detailed movement, many fans assume that the Chamber of Secrets door was a computer-generated effect. In fact, this intricate device was hand built by the Special Effects Department, based upon sketches provided by the Art Department. The snakes slither along tracks and are powered by a motor hidden behind the door. Look at the amazing details of the snake skin! “First years should note that the forest on the grounds is forbidden to all pupils. And a few of our older students would do well to remember that as well.” Harry Potter and the Philosopher’s Stone. 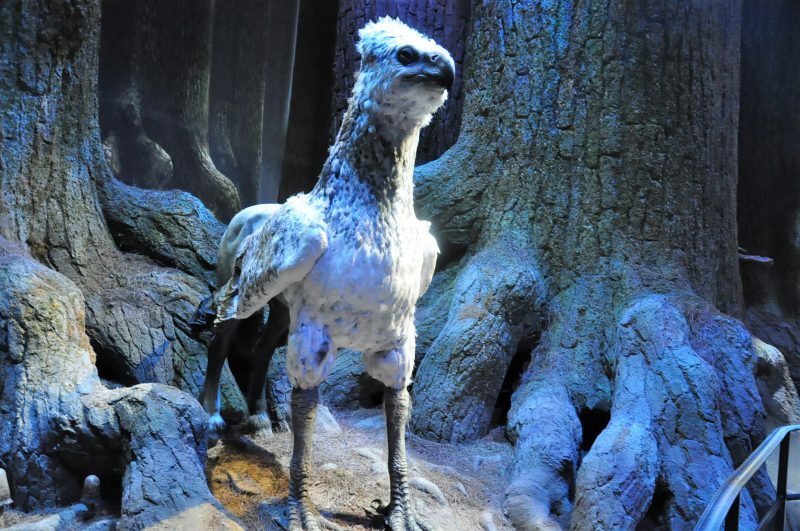 The Forbidden Forest is home to some of the most magical creatures and perplexing mysteries amidst the wizarding world. Production Designer Stuart Craig always considered the Forbidden Forest to be more than just a location, but a character itself. For the films, some Forbidden Forest scenes were shot on location, but most were shot on soundstages in Leavesden, on massive recreations of the forest that were designed by the Art Department and built by the Construction Team. Every detail, down to the texture of the bark and the angles of the roots was taken into consideration to ensure that the forest appeared both forbidden and foreboding. The Construction Team carved massive tree trunks that were suspended from above. Once those were in place, the gnarled roots were carved from the ground up and seamlessly attached to the hanging trunks. The forest sets were enormous, some of the trees were as big as 4,3 metres around! “Hagrid let them to the very edge of the forest. Holding his hand up high, he pointed down a narrow, winding earth track that disappeared into the thick black trees.” Harry Potter and the Philosopher’s Stone. The Forbidden Forest in the studios is quite new. The scenery changes between different day- or nighttimes and it hides some surprises for the visitor. It includes some strobe lighting effects that were used in the making of the films. If you are afraid of spiders, no matter what size, you should be careful. Aragog is looking forward to seeing young mortals! „You see, we have never been able to keep a Defence Against the Dark Arts teacher for longer than a year since I refused the post to Lord Voldemord.“ Harry Potter and the Half-Blood Prince. The Defence Against the Dark Arts classroom was shot on location at Lacock Abbey, Wiltshire for the Philosopher’s Stone. For the following films, a new Dark Arts classroom was designed and built on the soundstages at Leavesden. 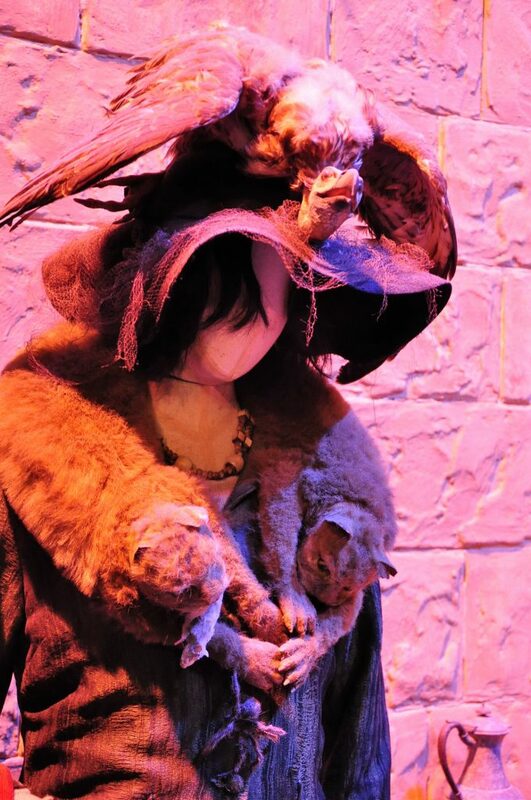 The costume from Lupin’s Defence Against the Dark Arts lesson, where Neville’s Boggart turned into Snape, wearing an outfit from his grandmother. 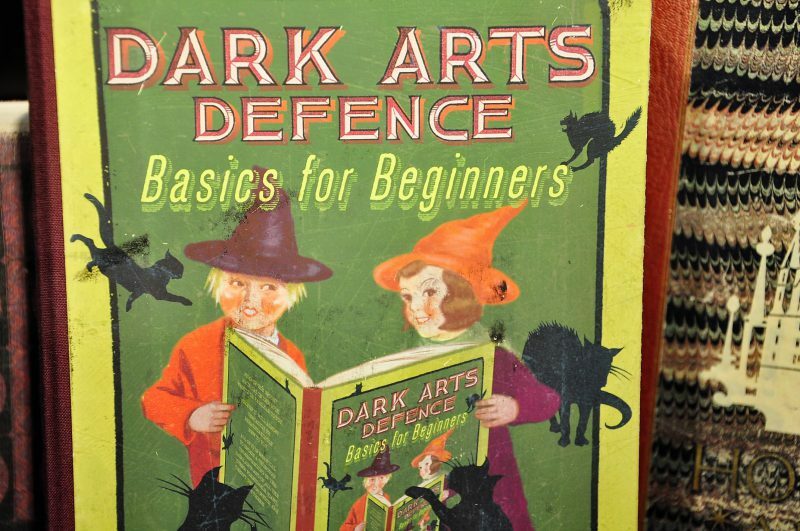 Below you see the old book that Umbridge used for her Defence Against the Dark Arts lessons. Some of the original props, like the massive dragon skeleton, were retained for the new set. Professor Lupin introduced the gramophone and Boggart wardrobe, while Professor Snape used the “magic lantern” style projector for a lesson on werewolves in the Prisoner of Azkaban. “Most of the cottage was still standing, though entirely covered in dark ivy and snow, but the right side of the top floor had been blown apart; that, Harry was sure, was where the curse had backfired.” Harry Potter and the Deathly Hallows. After half of the tour, the visitor enters an outside area which is packed with props of buildings, the Knight Bus, Hagrids Motorbike or the Weasley’s Ford Anglia. 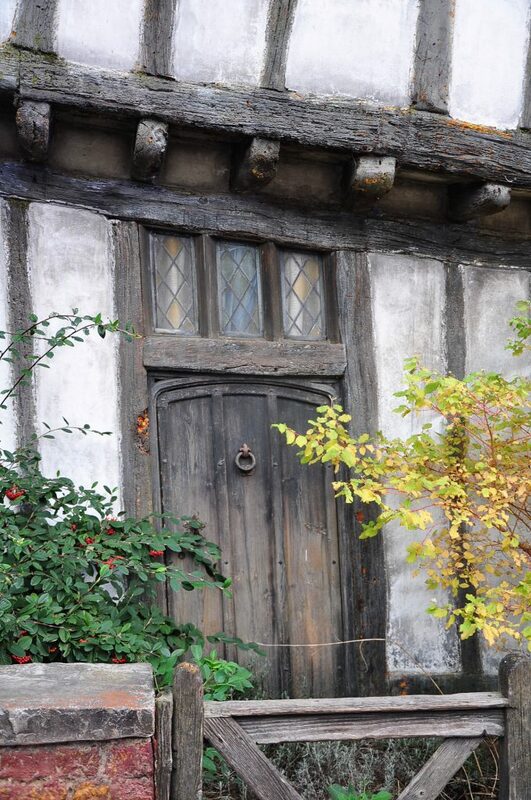 One of these props waiting for us at the Studios is also the scenery of Godric’s Hollow. The home of Harry’s family had been left untouched since the night that Voldemort murdered the couple and left Harry with his scar. On the remains of the house grow some plants and bushes, giving the sad place a tiny bit of life. Stuart Craig was inspired by the village of Lavenham, in Suffolk, when it came to recreating the cottage in Godric’s Hollow. Right next to Harry’s former home we can now enter one of the most famous vehicles of the Harry Potter movies – the light blue, flying car of the Weasley family. The 1959 Ford Anglia 105E Deluxe was first produced by Ford of England in 1959. The car was designed as an economical option during the fuel crisis following the closing of the Suez Canal in 1956. Although there is only one flying Anglia in the film series, the crew actually used 16 of the vehicles during production. The crew smashed up 14 cars to various levels of distress in order to shoot the Whomping Willow scene in the Chamber of Secrets. “The tree they had hit was attacking them. Its trunk was bent almost double, and its gnarled boughs were pummelling every inch of the car it could reach.” Harry Potter and the Chamber of Secrets. On screen, the Whomping Willow appears massive enough to support a car. In reality, only two sections of the tree were built to scale. The first was the tree trunk that supported Harry, Ron and the flying car. The other was the animated “knuckle” that did the whomping. 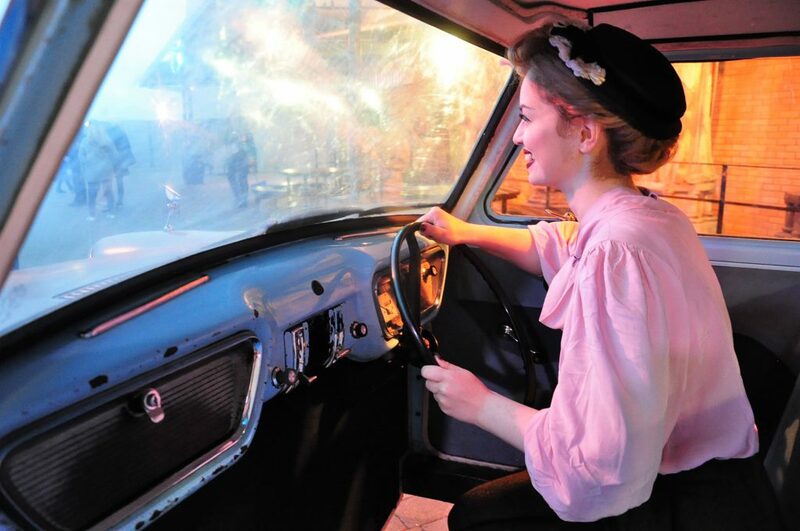 In the Warner Brothers Studios you can of course sit inside the Ford Anglia as well! In the studios one can also have a closer look at the mechanic of the Whomping Willow. The Visual Effects Department augmented the live action footage with digital effects to create a seamlessly believable sequence. Though the Dursley’s place is not connected to the world of the Dark Arts, I would like to include it into my post. It is quite a lovely experience entering Privet Drive. 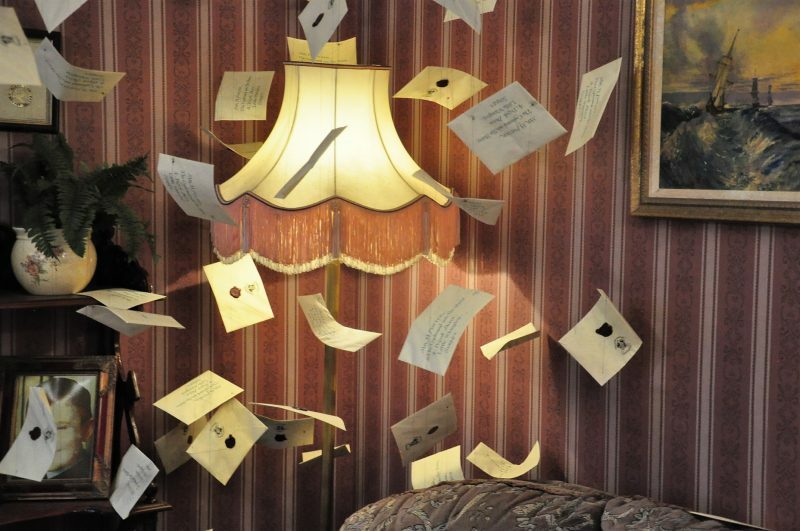 At my last year’s visit one could see the houses from the outside, but this time it was also open to enter, walk through the narrow hallway and see the hundreds of letters from Hogwarts flying around the tiny, kitschy living room. 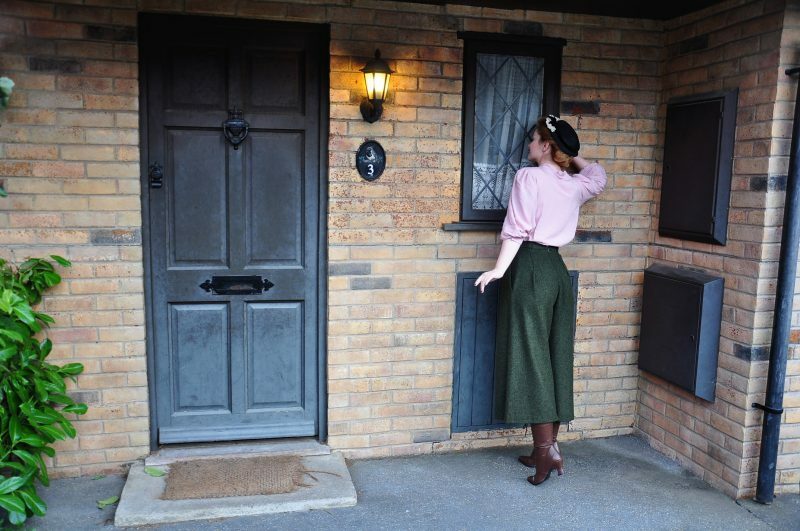 In the photo above you see me on a normal day, leaving my home at Privet Drive no. 3 to visit my neighbours for tea next door. Below I am standing in front of the Dursley’s (I mean my neighbour’s) home itself. 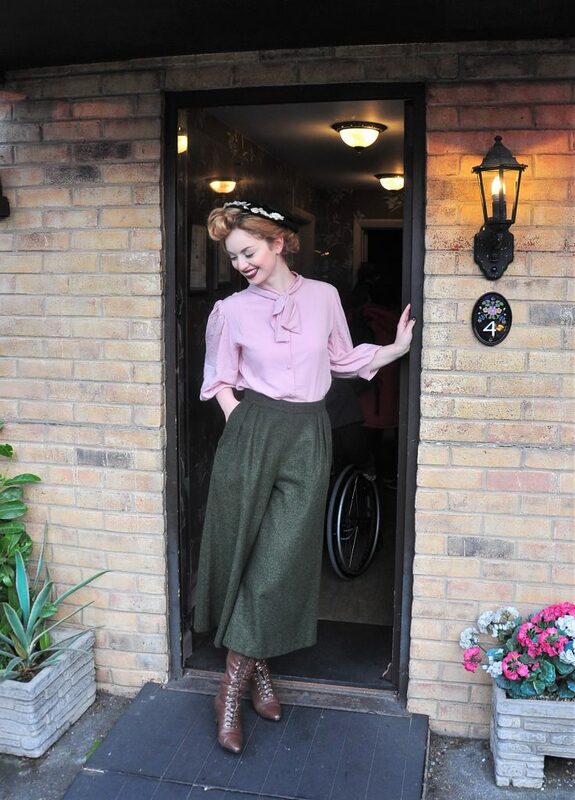 The garments that I am wearing were kindly given to me by Gracy Q. I combined the Elsie Blouse with the Tottenham Culotte, as I think the colours as well as the shapes match the Hogwarts fashion in a perfect way! I especially adore the cuffed sleeves of the blouse and the Herringbone material of the Culotte. The shoes are fake leather and I found them here*, the hat is a vintage piece. At first sight, these houses look like typical normal English front doors, but this is exactly what the film crew wanted to display. As the Dursley simply want to be a typical and average English family. By the time the production ended in 2011, the prop team had filled five giant warehouses, including amongst other things: 5.000 pieces of furniture, 12.000 handmade books, 15.000 glass prophecy spheres, 17.000 wand boxes and 40.000 individual Weasleys’ Wizard Wheezes products! „There’s no costume without a character.“ Jany Temime, Costume Designer. Next to the incredibly impressive, highly detailed props and sceneries of the movies there is one thing making the coming-to-life of Harry Potter’s stories extremely authentic and special: the costumes. 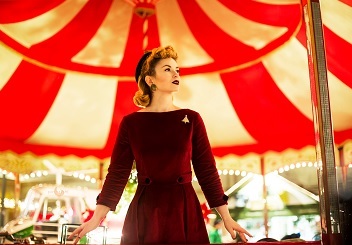 The Costume Department designs, creates and selects all of the costume pieces for a film, ranging from Hogwarts robes and street clothes to detailed costume accessories like jewellery, hats and handbargs. For each film in the Harry Potter series, more than 50 costumers faced the unique challenge of designing for a rapidly maturing principal cast. Not to forget the costumes for the hundreds of Ministry members or Gringotts goblins! This versatile department was led by Judianna Makovsky and Lindy Hemming for the first two films, Jany Temime helmed the team for the final six films. 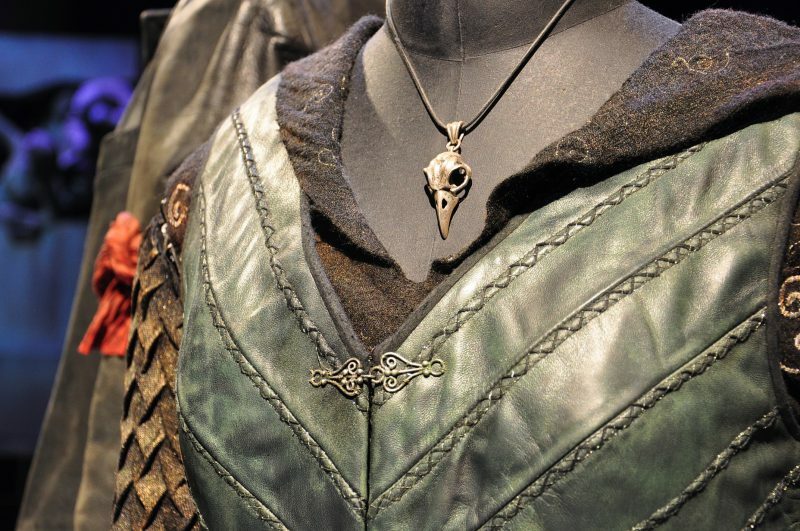 Detail of a garment worn by Helena Bonham Carter in the character of Bellatrix. 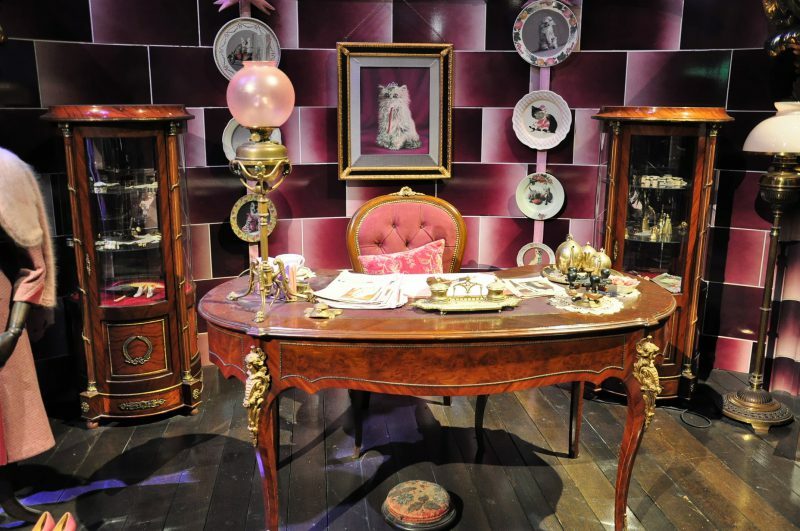 Dolores Umbridge’s Ministry of Magic office in the Deathly Hallows – Part 1 retains many of Umbridge’s nuances that were featured in her Defence Against the Dark Arts office at Hogwarts in the Order of the Phoenix. Among these are her pink motif and her love of ornate furniture, which set decorators found at a Middle Eastern furniture shop tucked away in North London. The kitten plates on the wall came to life with dozens of super cute felines. For this effect, one Prop Buyer journeyed all over London, acquiring and stacking hundreds of plates in the back of her tiny car. Then, one of the Second Unit’s most memorable days was filming all the cats – from white kittens to peculiar-looking hairless breeds – with goldfish-bowls, crystal balls, miniature witches’ hats and other props. By using bright green paint on the plates, the Visual Effects Department was able to insert the cat footage during post-production. 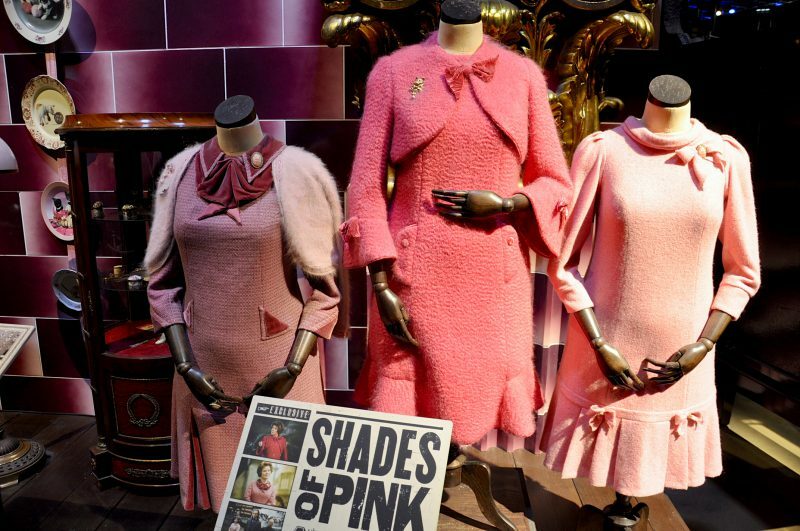 Pink was the predominant colour for all of Umbridge’s outfits in Harry Potter and the Order of the Phoenix. 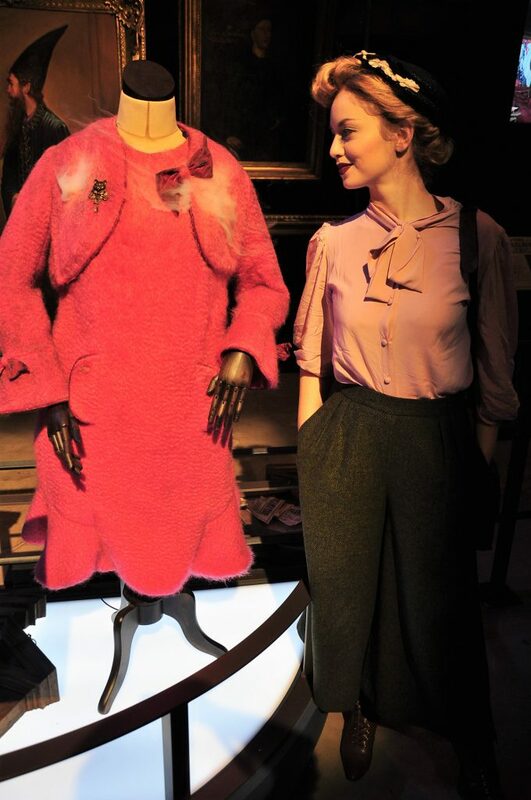 As she gained more and more power at the Ministry of Magic, Dolores Umbridge’s wardrobe got progressively pinker, as did the pink accents on the clothing of her workers. I think she really would have approved my pink Gracy Q blouse! In the photo above I am standing next to a version of her Defence Against the Dark Arts costume. It was hand distressed using wire brushes, dirt and paint to appear as though the outfit had been scorched by Fred and George Weasley’s fireworks. “It’s what You-Know-Who’s supporters call themselves,” said Bill. “I think we saw what’s left of them…” The Goblet of Fire. I guess the climax of the Dark Arts in the Harry Potter movies was definitely the big comeback of the Voldemort and his Death Eaters. 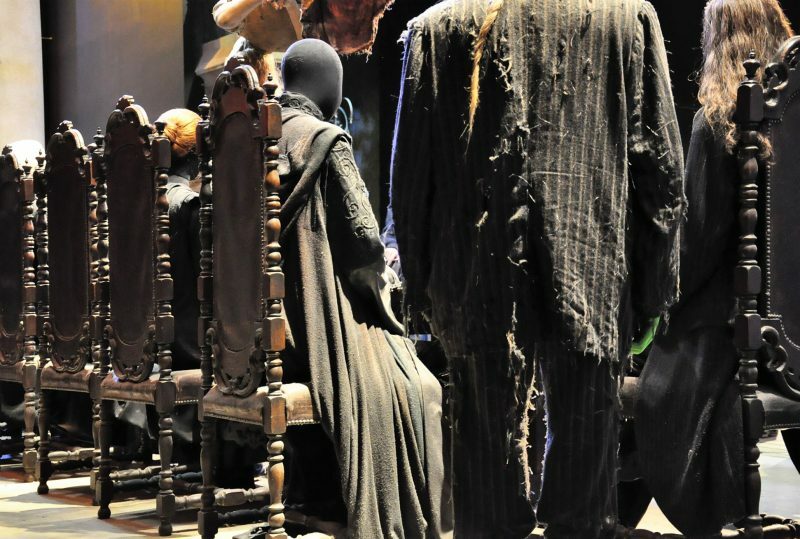 As followers of Lord Voldemort and practitioners of the Dark Arts, the Death Eaters first appeared in the films covertly concealed under long robes and skull masks in the Goblet of Fire. For the Order of the Phoenix, the concept artists simplified their design by removing their pointed hats and giving each Death Eater a unique mask hand-picked by Director David Yates. To construct the skull-like Death Eater masks, the Creature Effects Department made life casts of each actor’s face. The moulds were then used by the Prop Depatment to create unique masks with a weathered pewter finish. 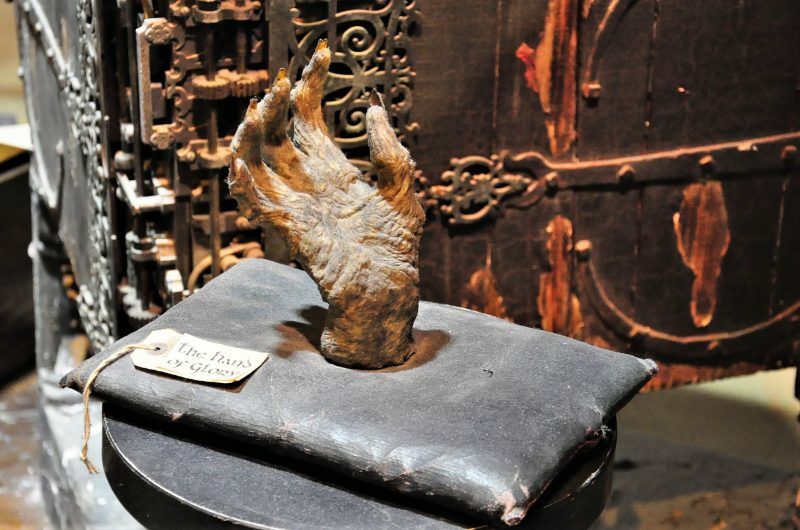 The Vanishing Cabinet or the Hand of Glory were created early in the film series, when the producers were still unaware of Rowling’s plans to include them in the plot twists still to come in the later movies. The Death Eaters meet at Malfoy Manor, Draco’s childhood home. It was designed to contrast sharply with Harry’s humble upbringing at number four, Privet Drive. Lord Voldemort gathered with the Death Eaters there to strategize the takeover of the Ministry of Magic. During this meeting, ‘He-Who-Must-Not-Be-Named’ relieved Lucius Malfoy of his wand and fed Muggle-sympathiser Charity Burbage to his snake. 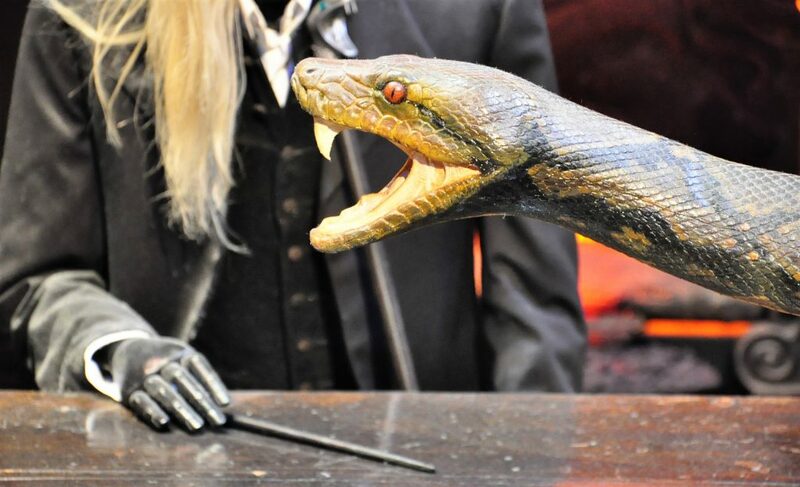 Nagini was created by combining several different elements including a live snake, computer-generated visual effects and several full-size versions of the serpent like the one displayed in the studios, which you can see on the photos. They were all hand-painted and sculpted by the Creature Effects Team. So now we are coming to end of the long and extremely fascinating tour behind the sceneries of the movies. I would like to end this post with the same quote I used in my other text. A quote by J.K. Rowling that says a lovely goodbye to everyone finishing the Studio Tour, whether the visitor feels he or she belongs to the dark side of magic or the good one. A quote that gives me goosebumps everytime I read it. And I would like to thank you for accompanying me through Hogwarts again! If you are planning to visit the studios near London as well, whether by train, broomstick or flying car have a look at my post „Warner Brother Studio Tour London“ for hints on this journey. This post also features some more specials of the tour.